On February 28, 1968, men and women from 124 different countries and 23 Indian states placed soil from their homelands inside an urn to symbolize the inauguration of Auroville, an experimental township. Its founder, Mirra Alfassa, said that Auroville was “meant to be a universal town where men and women of all countries are able to live in peace and progressive harmony, above all creeds, all politics and all nationalities.” Not only would Auroville ideally become an inclusive, non-discriminatory, self-advancing space, but it would also become a place of “environmental regeneration” to demonstrate the community’s “progress, evolution, and contributions” to the world. 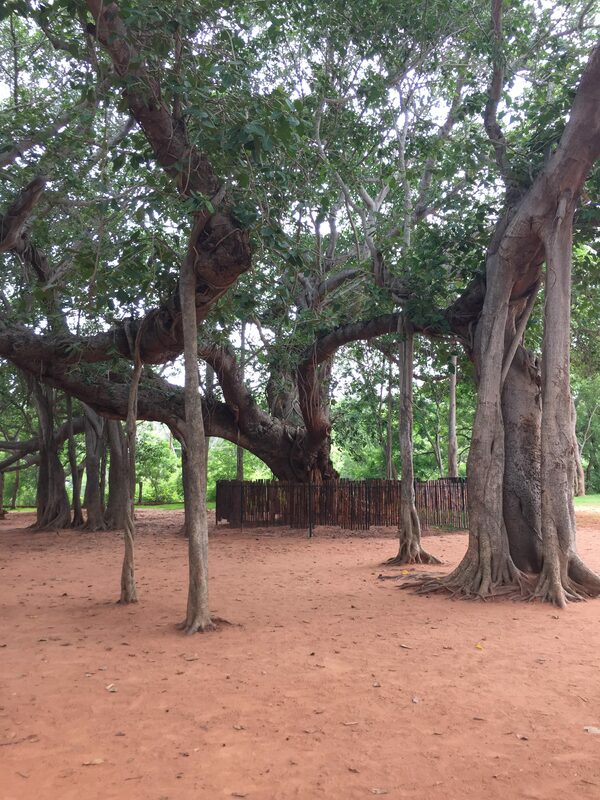 We visited Auroville last week during our trip to Puducherry. It amazed me how green Auroville is, in comparison to other parts of India that I have seen so far. This distinction is noticeable because the town lacks the urban character caused by innumerable vendors, endless traffic, and excessive pollution that is present almost everywhere else. Additionally, its rich vegetation and abundance of flora diversity, particularly the mystical feel that the banyan trees provide, contribute to the idea of Auroville being its own entity within this country. Unfortunately, as a tourist of Auroville for a single day, my exploration of this utopian community was limited. I could only see the Visitor’s Center, the Matrimandir from its viewing point, and the walking path in between those two areas. The Matrimandir is an enormous, golden, spherical temple that, just as the town, is not associated with any religion. It is meant to be a place to “find one’s consciousness” through concentration. After the tour ended, I read a quote describing Auroville as “the city the Earth needs.” Therefore, as a student interested in ecology and conservation biology, instead of just focusing on the social and spiritual goals that Auroville strives for, I began thinking about the ecological practices within this community. They engage in a myriad of green practices, from the use of solar energy, to reforestation, to organic farming. 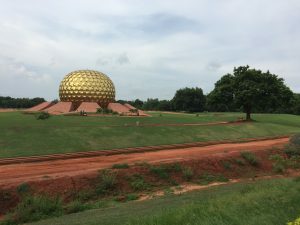 However, because of the vast amounts of trash that are visible in the streets of India daily, I was particularly interested in how Auroville manages their solid waste. 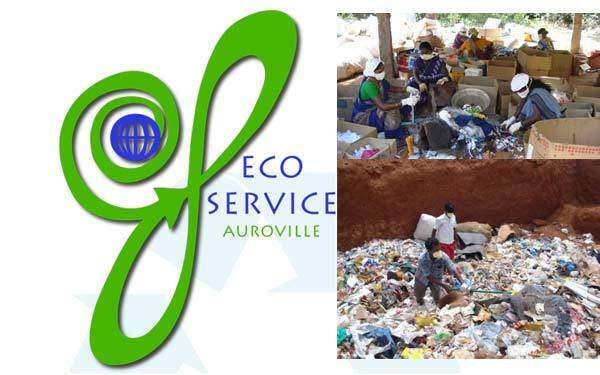 Auroville’s main waste collection practice is called Eco-Service. This program’s goals consist of collecting and processing waste, networking and collaborating with other villages and organizations regarding waste management, educating and creating awareness about this topic, and researching and developing further waste management methods. Overall, Eco-Service functions with two teams.One team collects solid waste from the town, its main roads, and some other areas surrounding Auroville. Another team processes and sorts the waste at a designated shed. After the waste gets sorted, the Eco-Service either sells it to recycling dealers, or landfills it at the Auroville landfill. Auroville aims for a “zero waste” status, therefore they recycle as much waste as they can, and landfill as little as possible. Based on the eco-friendly practices that they claim to follow, specifically regarding waste management, I noticed that Auroville is not only a spiritual and equality-driven utopia, but also a place where advances to fight pollution and conserve mother Earth prevail. Tomorrow we are leaving for Hyderabad where we will be collaborating with the staff of Hyderabad Urban Lab. I am very excited to learn about the waste management practices in the city. With pollution being such a relevant issue in India, I am interested in comparing different methods used in different locations around the country.